One day for one grid. 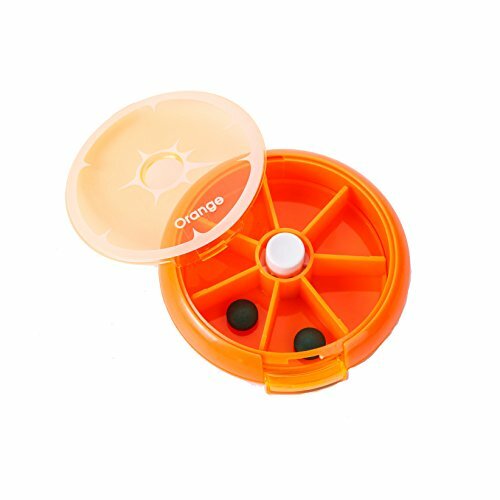 With the help of the medicine box, it is much easier to avoid of forgetting to take medicine while you are busy at work or happyy hour outside. Tilt the box cover upwards, draw out the cover and put the granule medicine inside, when to take the medicine everyday, only need to take a turn to take the medicine out you need.No matter where you have been, office, room, coffee shop, or walk in the street, just put the box in your pockets or bags, you can easily take medicine on time and keep yourself healthy. Product size: Diameter x Height = 90 x 25 mm, with the weight 60g. Environmentally healthy ABS plastic material, three colors can be selected. Very convenient to take it anywhere, one grid stands for the one-day dosage. With the lovely design and fresh color, there is no afraid to have medicine any longer. Transparent visualization box cover makes it easy to know when and which kind of medicine shoule be taken. If you have any questions about this product by Heave, contact us by completing and submitting the form below. If you are looking for a specif part number, please include it with your message.